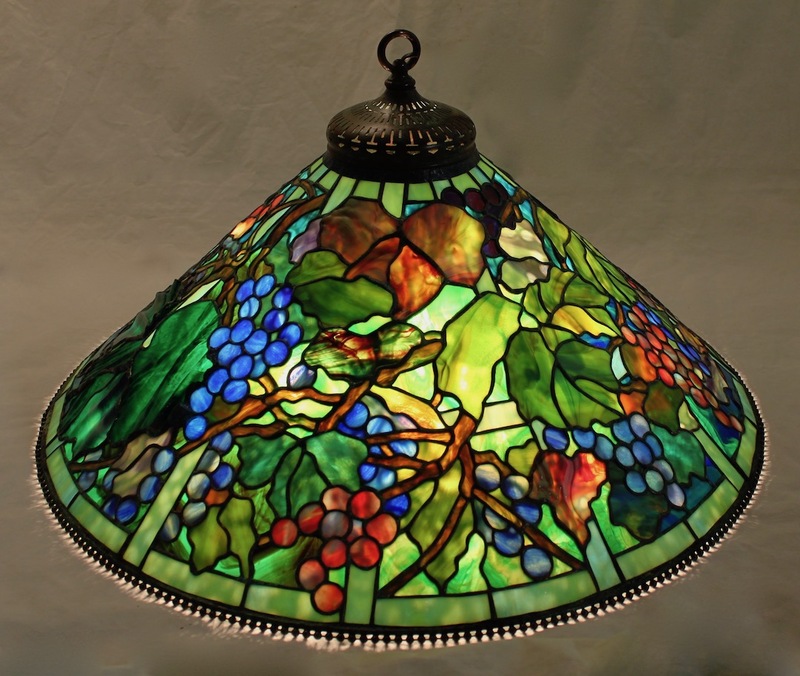 Century Studios is pleased to introduce a new design to our line of reproduction Tiffany lamps, the 28″ Grape Trellis. Designed by Tiffany Studios as a chandelier fixture, the shade can also be used as a floor lamp or oversized table lamp. This exciting new lamp is currently available in our showroom. 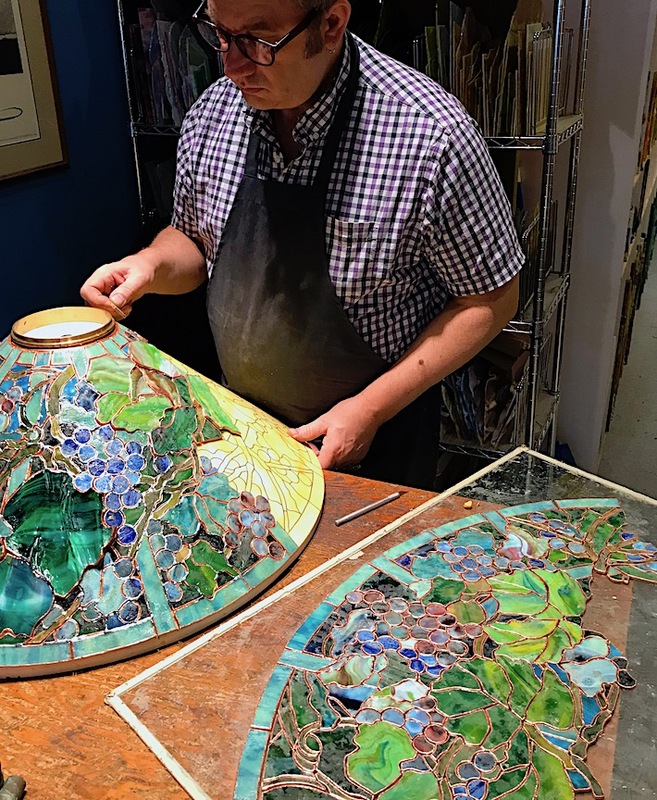 28″ chandelier cones give the lamp artist a an exciting opportunity to showcase the beauty of stained glass in ways not possible on smaller shades. The intricate patterns and expanded surface area allows for more variety within the shade. 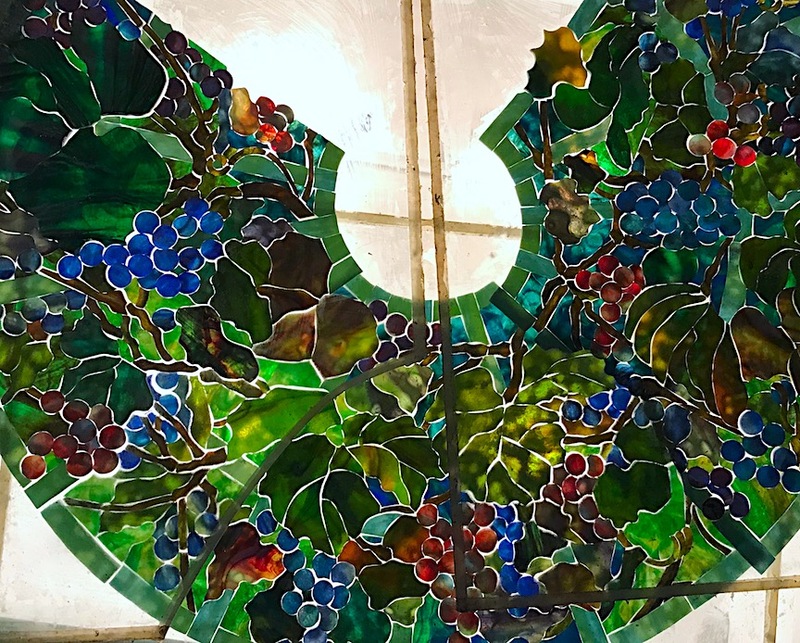 The 28″ Grape Trellis pattern is defined by the trellis itself, which provides a visual structure for the leaves and large clusters of fully mature fruit to realistically intertwine across the surface of the shade. The 28″ Grape Trellis has a non-repeating pattern. We began the layout process by choosing glass for the trellis. The color of the trellis tones every aspect of the piece since it appears throughout the entire shade. The background areas were cut from a number of different glasses that sometimes blended, and in other places contrast with one another. 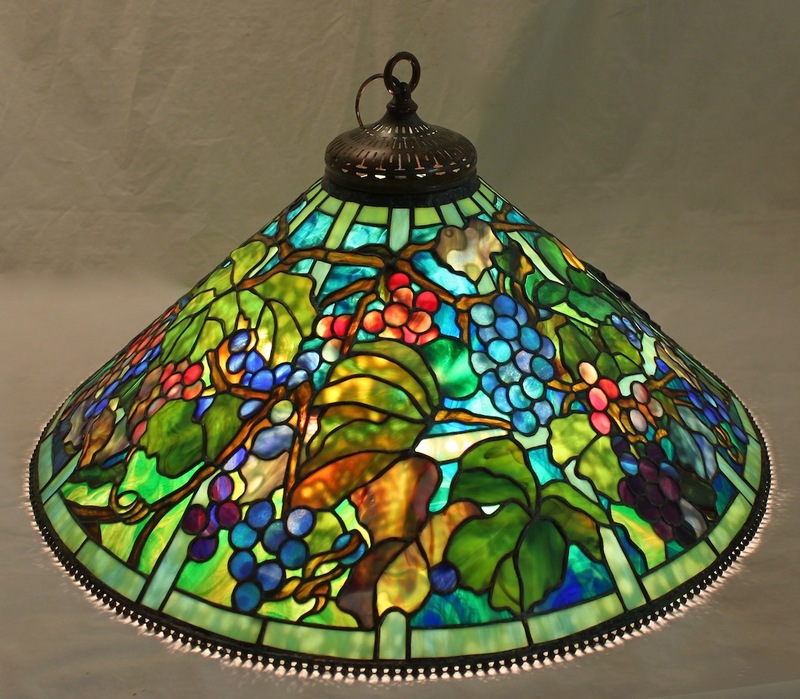 A wide variety of textures, colors and transparencies of glass were chosen for the fruit and foliage. 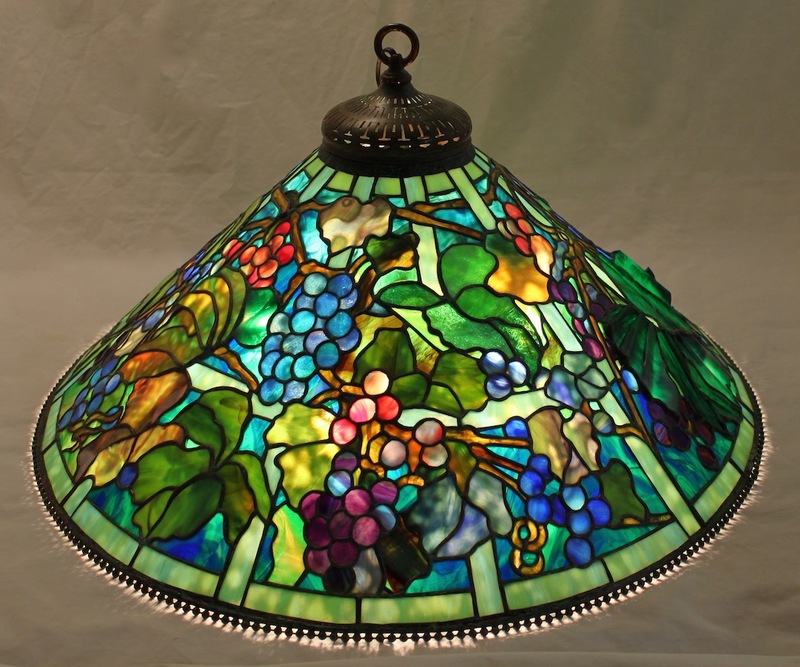 Ring mottled glass imparts a sun dappled effect to the leaves and provides shading on the grapes. One of the features of this shade is the large leaf that is cut from drapery glass. The pleated folds of the drapery glass add a realistic element to the shade. 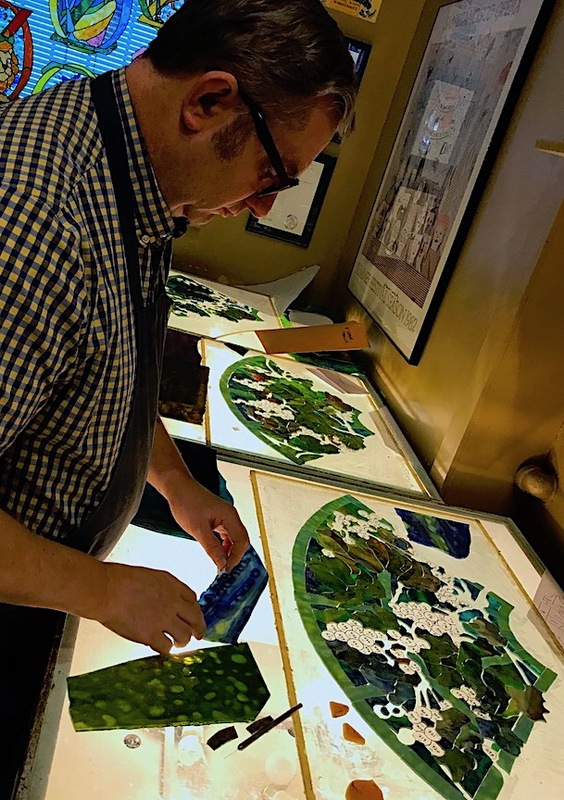 Once all the glass was selected, cut and fit, the pieces were foiled and then transferred onto the form. 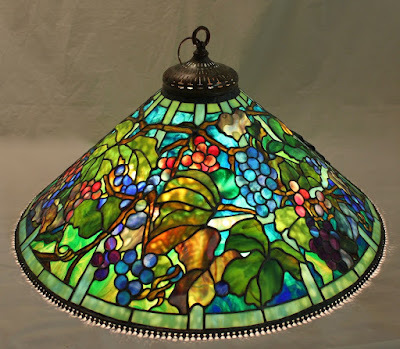 Soldering on a large shade will take multiple days. Once the exterior has been soldered together, the form is heated to melt the wax Part of the soldering process on large shades includes adding reinforcement wires to the interior of the shade. 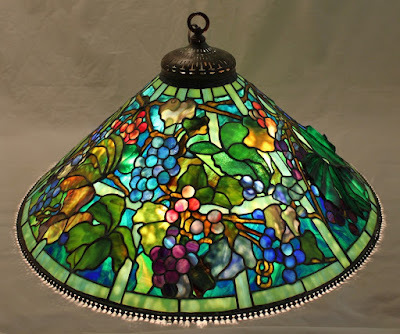 The final element is the addition of the bead chain border around the bottom of the shade. 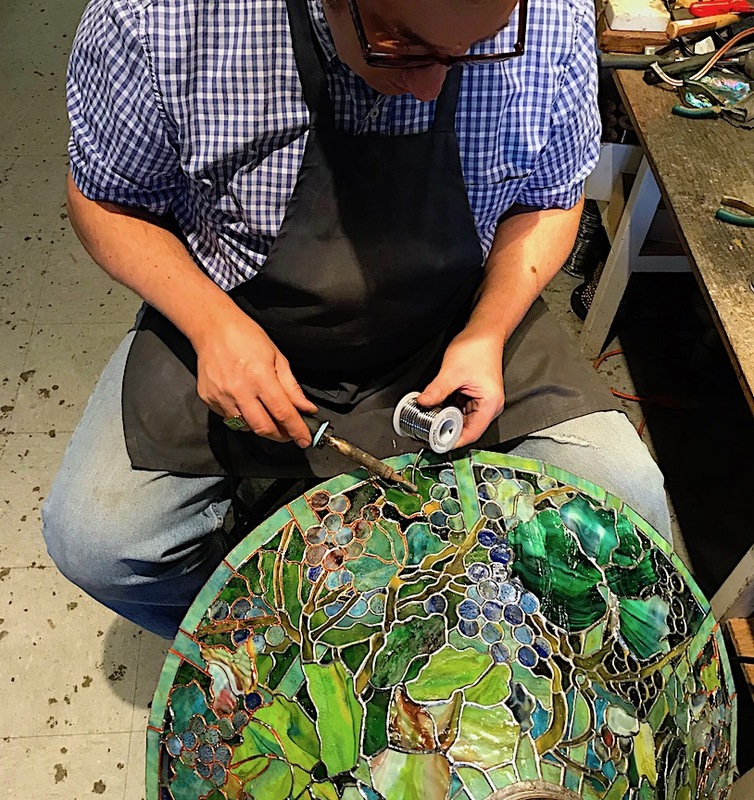 Each bead is carefully soldered in place to create the unique decorative edging. Because this shade has a non=repeating pattern, there are surprises to be found from every angle. 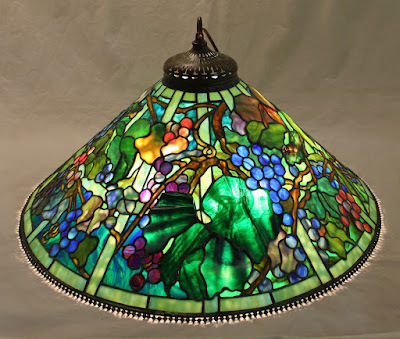 The Large drapery glass leaf undulates upwards from the surface of the shade. 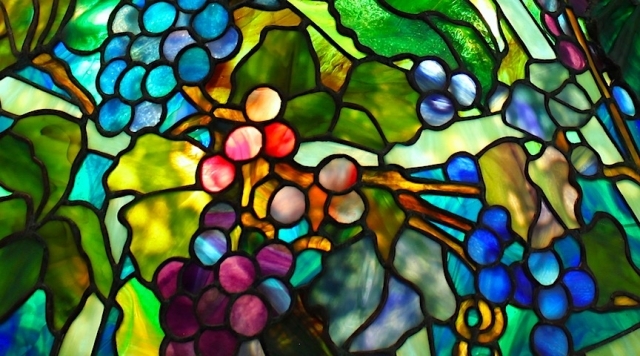 The grapes are a mix of lush blues, deep purples, and reds tinged with blue and green. Another important element of this design are the stems/branches that weave in and around the shade. From the hick woody main stems, smaller branches shoot out, binding the grapes to the trellis. 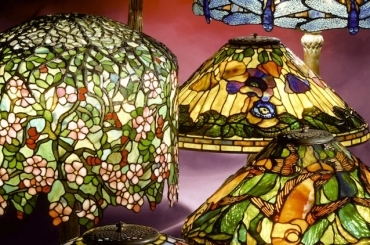 The completed shade is a visual delight that blends together glasses from all the major glass makers of the past 30 years. The overall tone of the piece is lush and bursting with life.